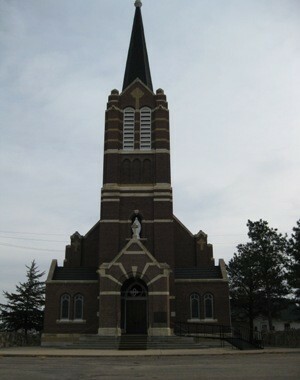 The photos below depict the church grounds as they appear in 2010. 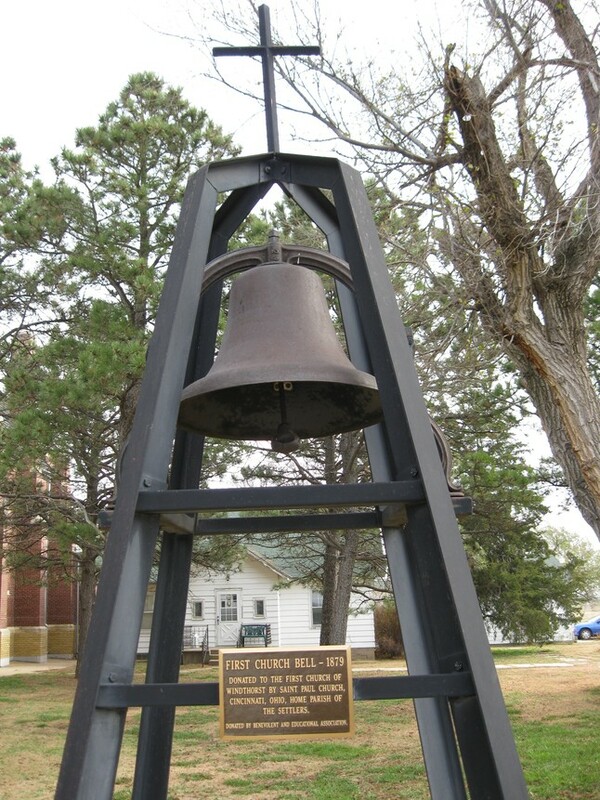 The first church bell was a gift from St. Paul's Parish in Cincinnati, Ohio. 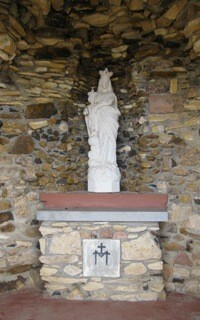 A grotto "In Memory" of Windthorst servicemen. 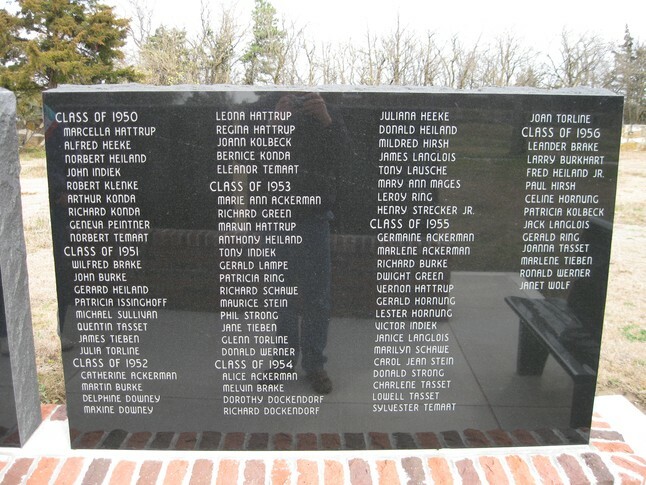 A memorial constructed in 2009, to honor the 427 graduates of Windthorst High School. Provided and written by Dan Torline. 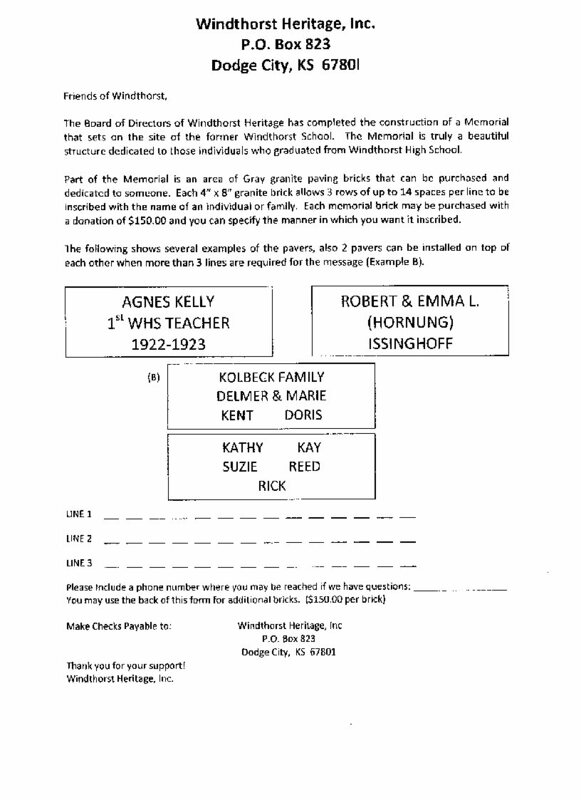 The following is an explanation of how the Windthorst High School Memorial came to pass. 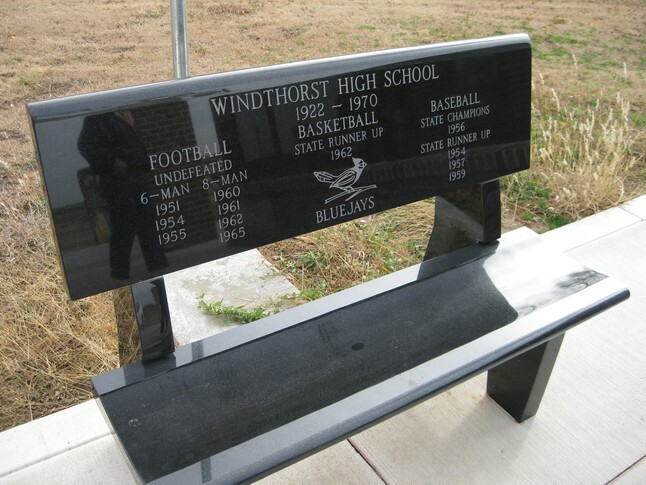 In October of 2007 Robert Hattrup, class of 1961, approached the Windthorst Heritage board requesting permission to erect a 4' x 8' plywood sign on the location where the high school used to set. Bob wanted to put information on this plywood sign to depict some of the past outstanding sports achievements. The Heritage board asked if Dan Torline, class of 1962, would contact Bob and try to design a suitable memorial. 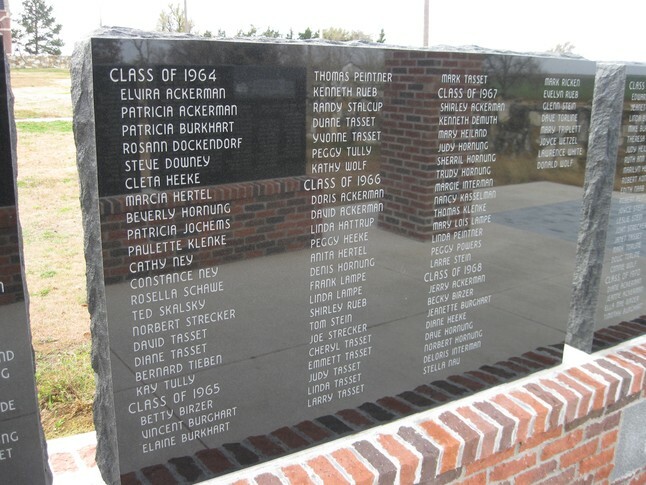 Dan then visited several military veteran memorial sites and it occurred to him that there would be no more graduates from Windthorst High School. 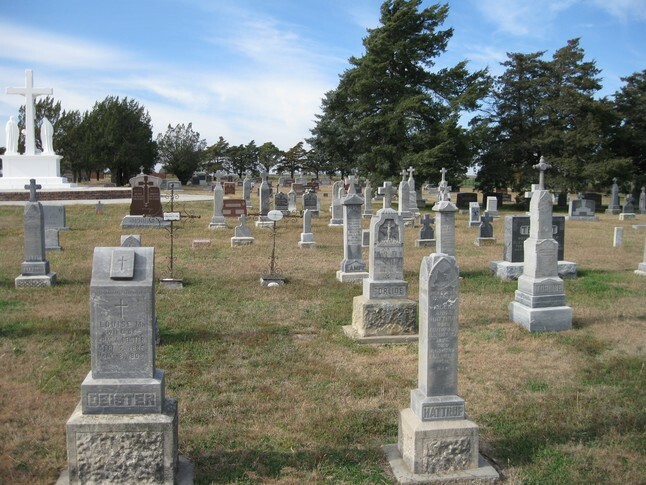 He then reviewed all the photos of the graduating classes and decided why not design a maintenance free memorial that would recognize each student by name, for each graduating class, by year. 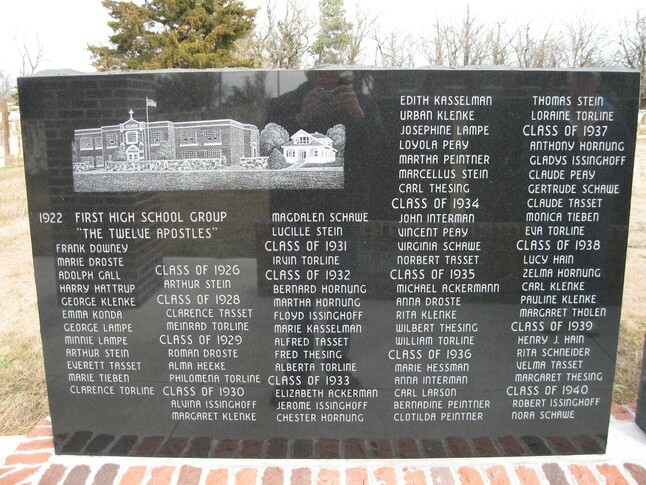 Six black granite tablets were designed that listed each student by name from the first class of 1922, to the close of the school in 1970. 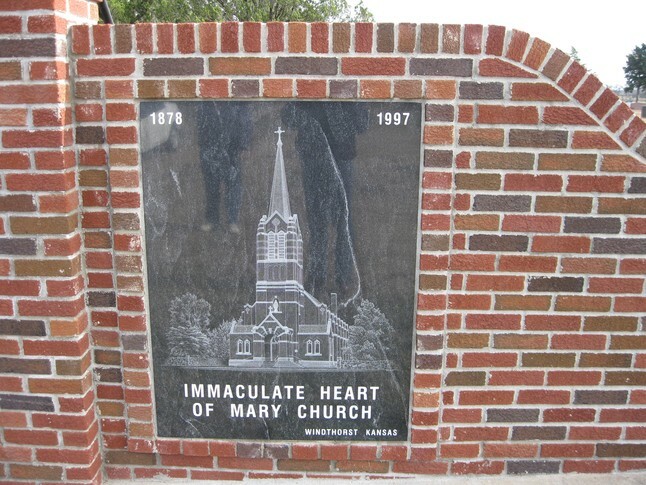 The first tablet included an etching of the school with the rock wall and also the nun's house. The sixth and last tablet included an etching of the gymnasium and the shop building. 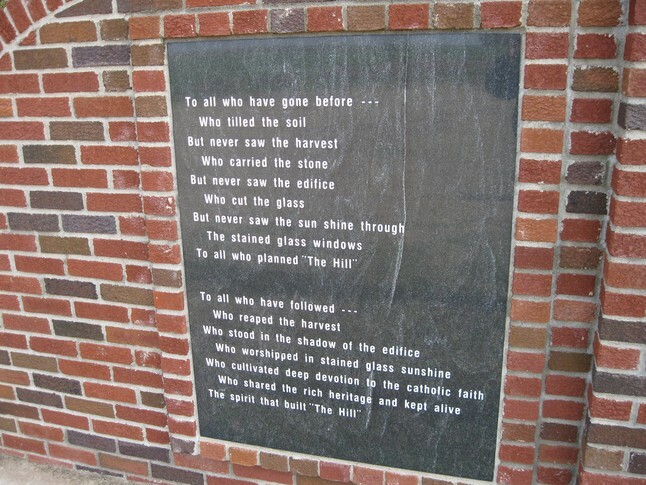 The entrance to the site of the six block granite tablets consists of two brick columns, constructed from the bricks of the original school building, which upon top was placed the salvaged head stone that was above the West door of the burned school building. Dan wanted to recognize the activities or subjects that were taught at the school. 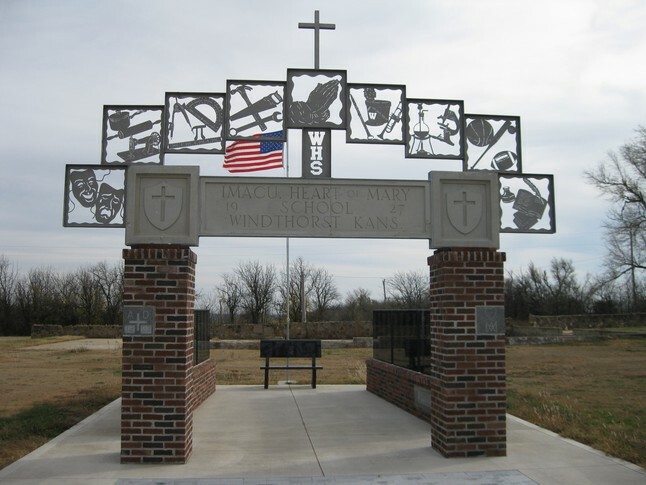 He then designed an arch of nine stainless steel panels to be placed above the salvaged school head stone. These stainless steel panels depict the following activities, speech and drama, science and chemistry, math, home economics, auto mechanics and woodworking, music and band, reading and literature, sports and the religious activities. 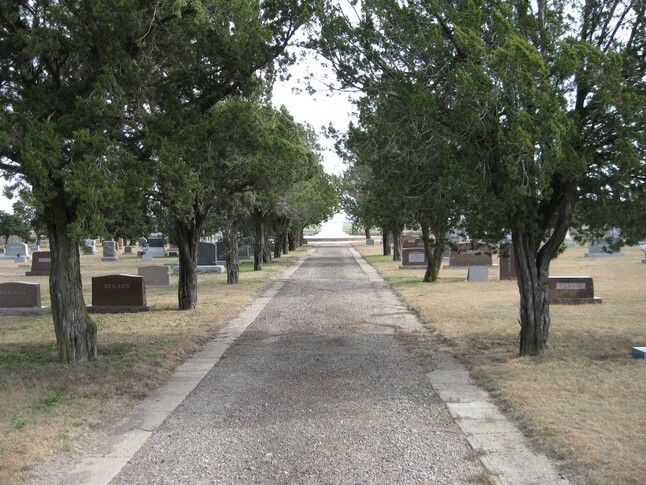 In the pathway to the memorial is an area that contains 4" x 8" granite pavers that can be purchased and inscribed, to finance the memorial costs and to help with the Windthorst Heritage expenses. 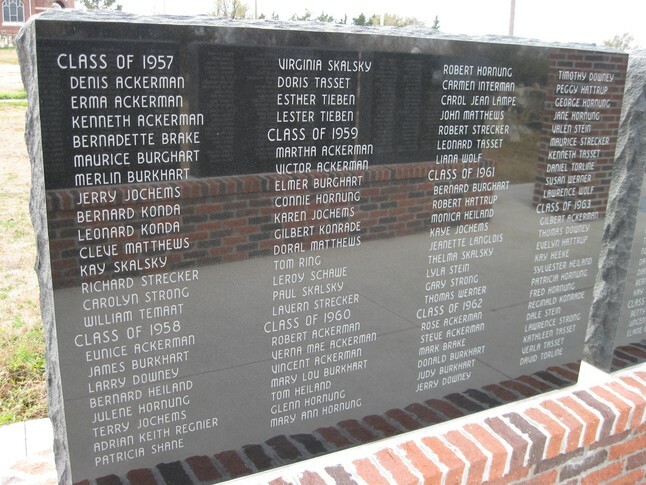 At the back of the memorial is a flag pole, underneath which sets a black granite bench, displaying the Bluejay mascot, along with the sports achievements that Bob wanted to put on that 4' x 8' plywood sign. 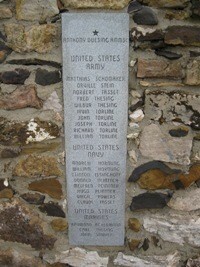 This beautiful memorial probably would never have been started if it hadn't been for the desire to erect a plywood sign! 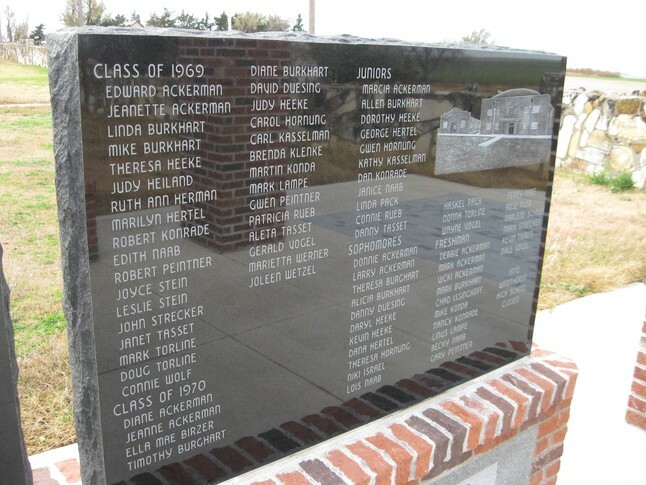 This monument dedicated to the graduates of Windthorst High School was designed by Dan Torline, Class of 62, and constructed by volunteers. 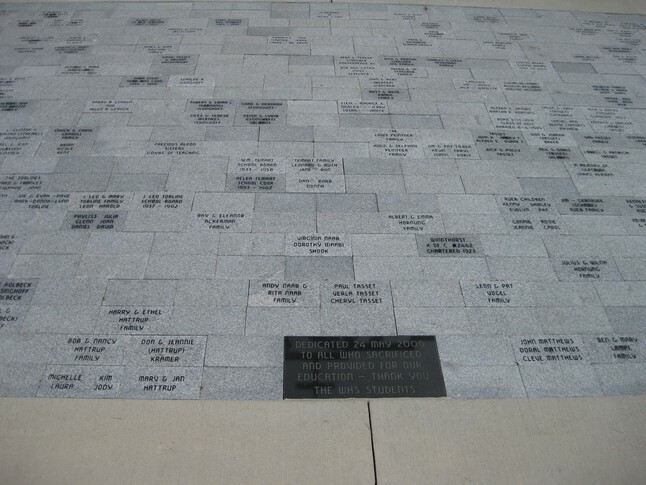 To purchase a paver, click here and print off a copy of the form. 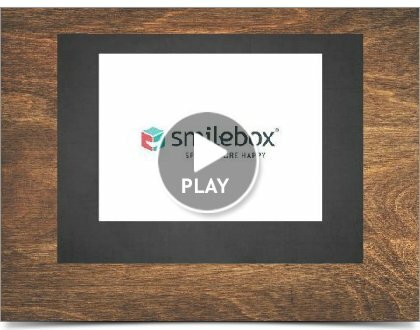 To watch a slide show of the memorial construction click the "Play Button" below. 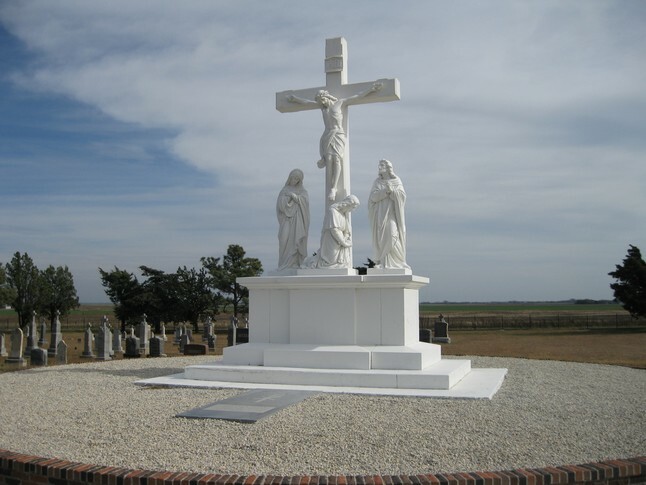 The main road of Holy Cross Cemetary leading to the center, Calvary sculpture. 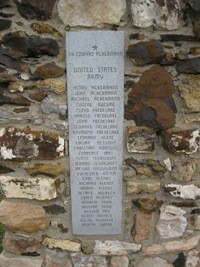 Grave markers of the early settlers. 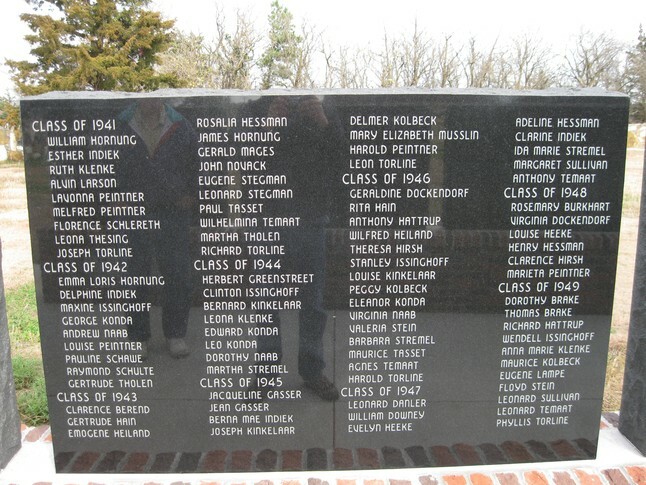 The bricks of the new cemetary entrance were taken from the school before it was demolished. 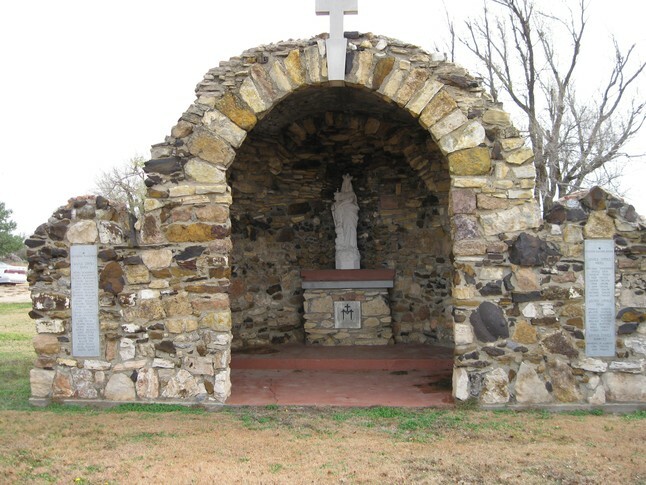 It features granite stones with an etching of the church and a poem dedicated to the people who built and settled the Windthorst community.